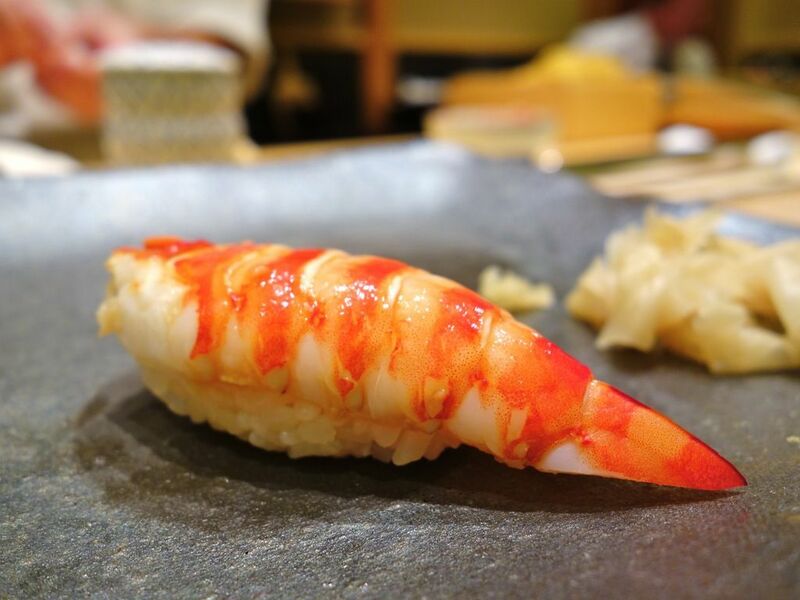 Ms Skinnyfat: Shinji by Kanesaka, Fine Japanese Dining. 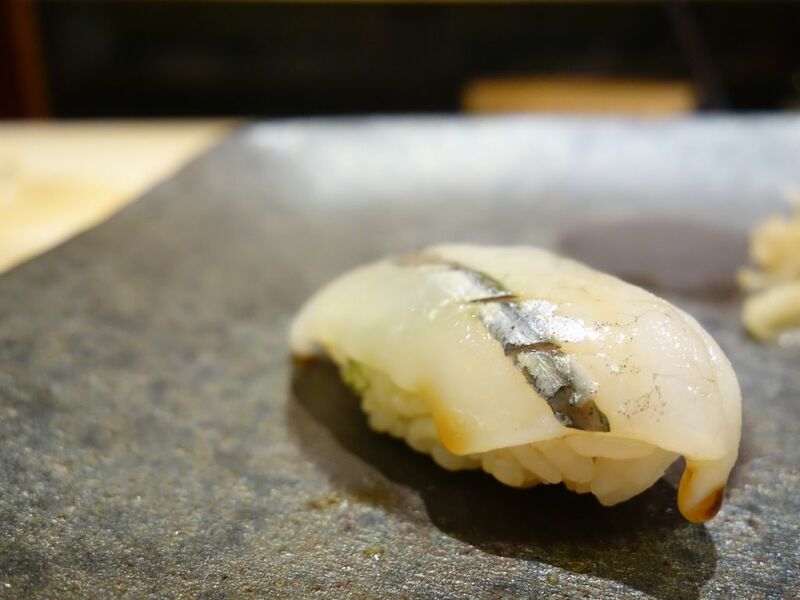 A special occasion called for celebration and S surprised me with treat at Shinji by Kanesaka, an extension of 2-star Michelin Chef Shinji Kanesaka’s Edo-style sushi restaurant first set up in Tokyo’s exclusive Ginza district. There are 2 outlets in Singapore and S went with the charming Raffles Hotel (good on him) and we had the pleasure of having Master Chef Koichiro Oshino serve us. Shinji Kanesaka's philosophy of staying true to its origins permeates through their food and also the decor. 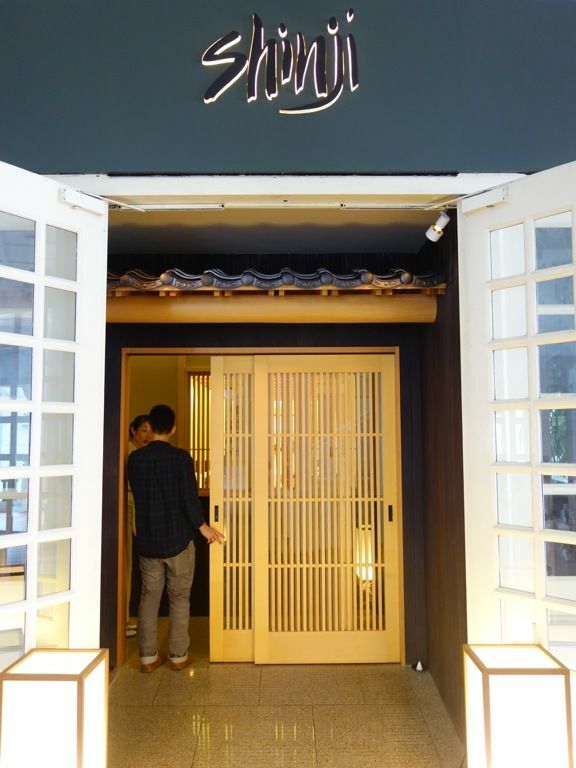 Like the original Ginza Sushi Kanesaka, Shinji by Kanesaka was also designed by Junzo Irikado. One highlight is the main sushi counter that is singularly carved from the trunk of a 220-year-old Japanese cypress or hinoki tree. A sushi master couldn't ask for a better stage to present his art. First time trying the baby sea eel and it has a smooth, rice noodle like texture. 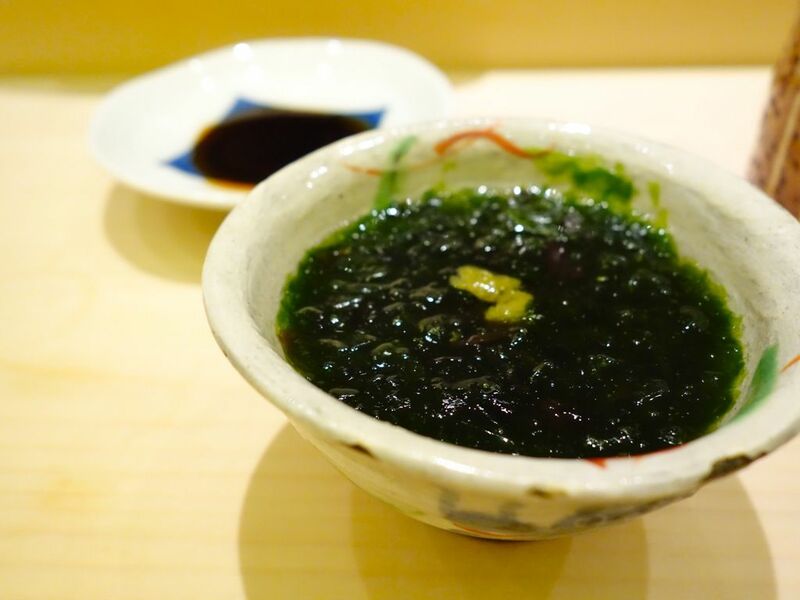 Nama-nori- fresh seaweed with yuzu pepper. Comforting start to the meal with a light umami broth that is warm. The yuzu pepper gave it a nice tang. The Yellow jack. A new fish to add to my sashimi orders. 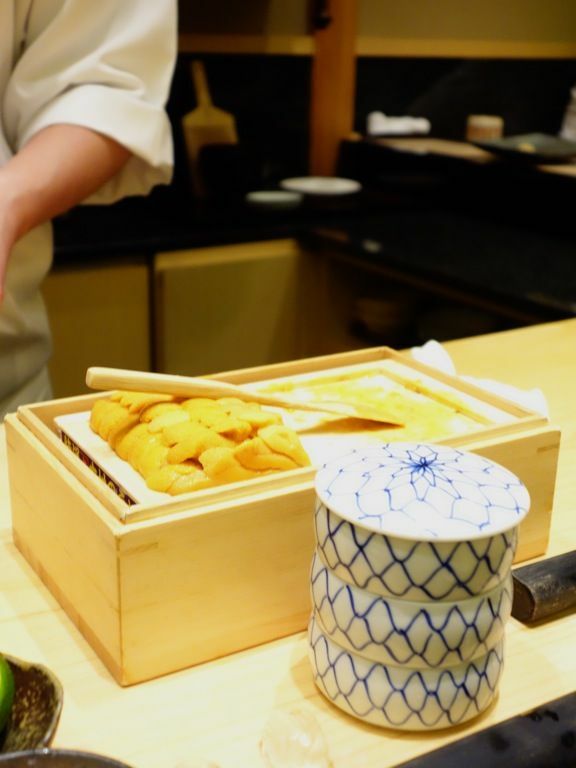 My eyes lit up when i saw the boxes of uni that Chef Oshino brought out. WHAT IS HE GOING TO DO WITH THEM! And it was a simple dish of Aka uni. Chef Oshino was very generous with the serving of uni. Loved the sweet creamy uni which i devoured in no time. 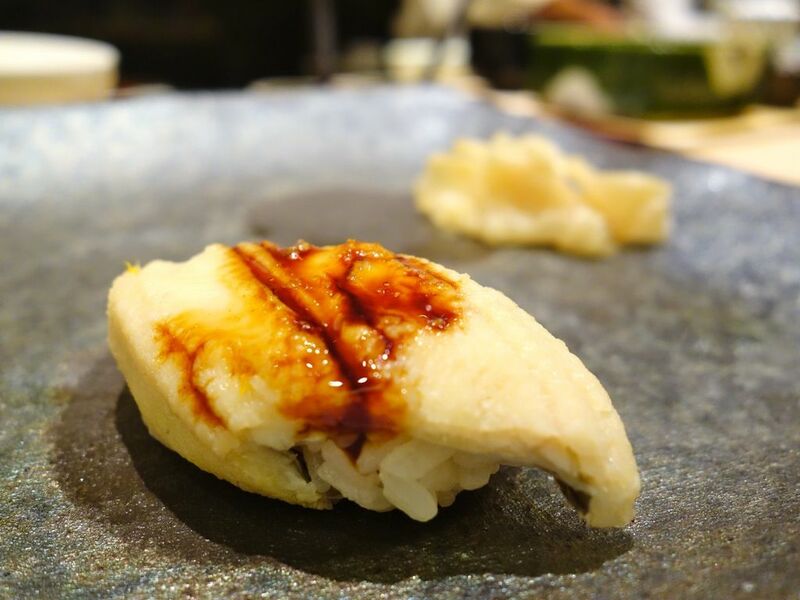 Akamutsu- a black throat sea perch that is very oily but perfect for the aburi method. 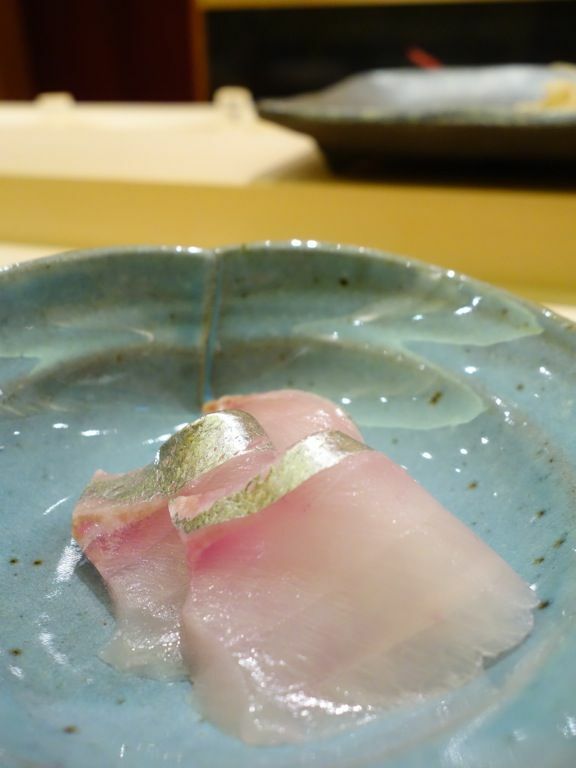 Foreground, a briny mackerel with seaweed. It's the season for Meji maguro, a baby blue fin tuna approx 6 months old weighing approx 5kg. The flavor is very light and clear, with a tinge of sourness. I'm not a fan. It just seems a little cruel..
Fried fugu. I wanted to eat that in Fukuoka but didn't do sufficient research. Decided that it's better not to kill myself accidentally so i didn't. 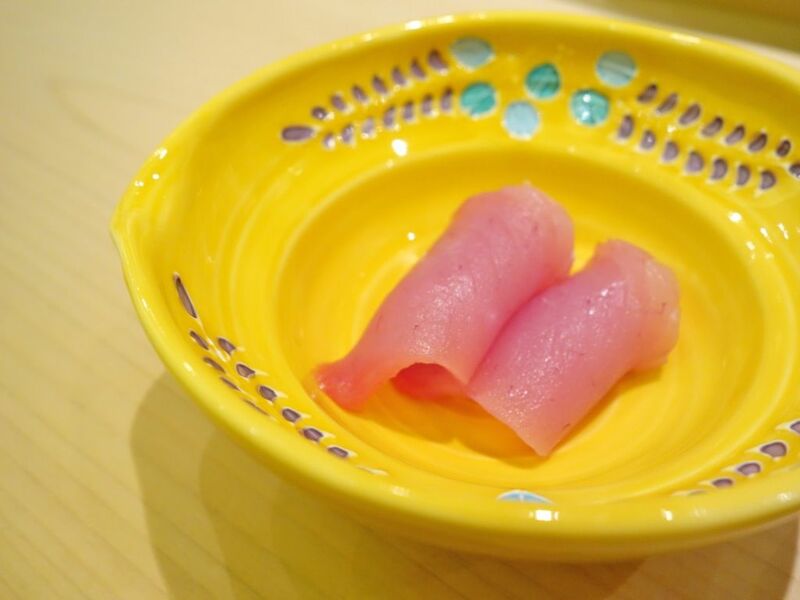 Firm fish meat without much flavor. It's really just another fish. Oh i love fresh momotaro! 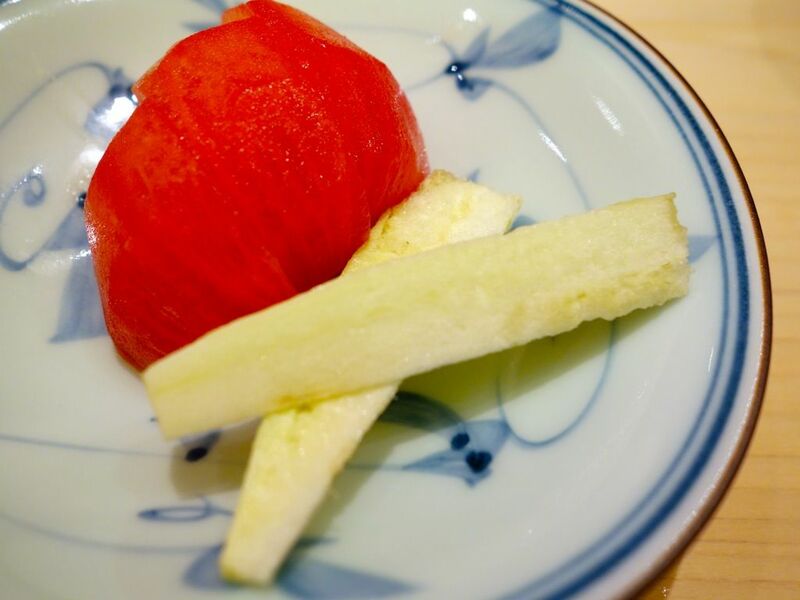 One of the chefs was skinning the tomatoes using a long knife that resembles a samurai sword (no kidding). We then moved on to the sushi course. 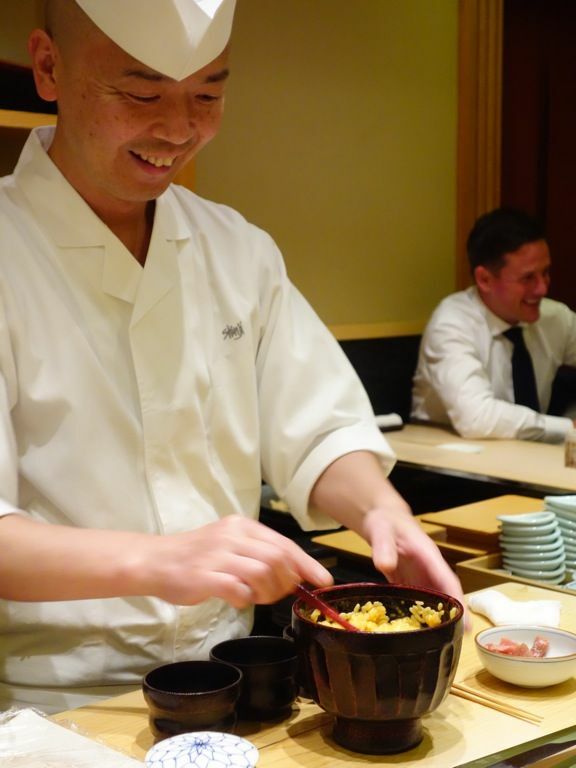 Chef Oshino told us that each ball of sushi rice at Shinji would have 150 grains of rice. Well, apparently a diner did a count and it turned out right #nothingbettertodo. Me? I sure wouldn't mind if there were more than 150 grains! The long nosed Sayori fish. The clean and fresh flavor was complemented with a shiso leaf paste that is lemony and refreshing. 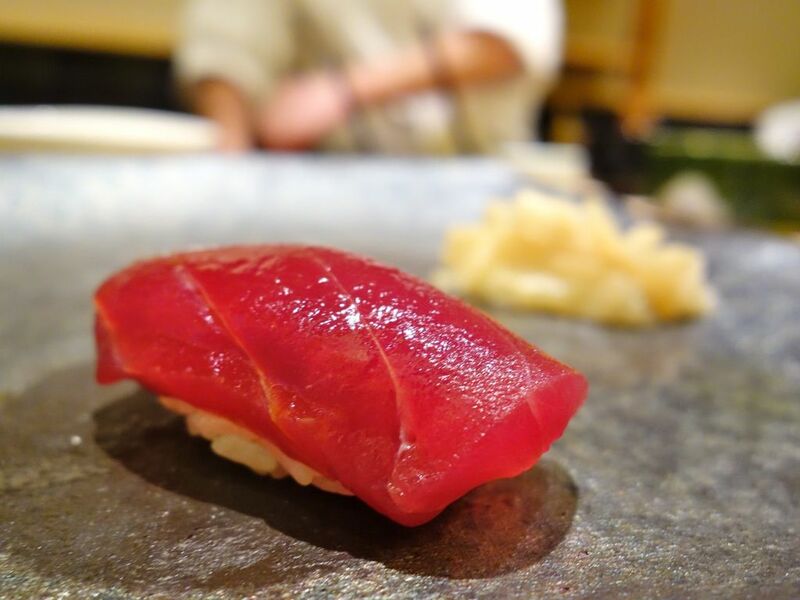 My favorite cut of blue fin tuna, the Chutoro. A medium fatty cut from the side waist. The fats melted a little from the heat of the lightly warmed rice. It literally slid down the throat. 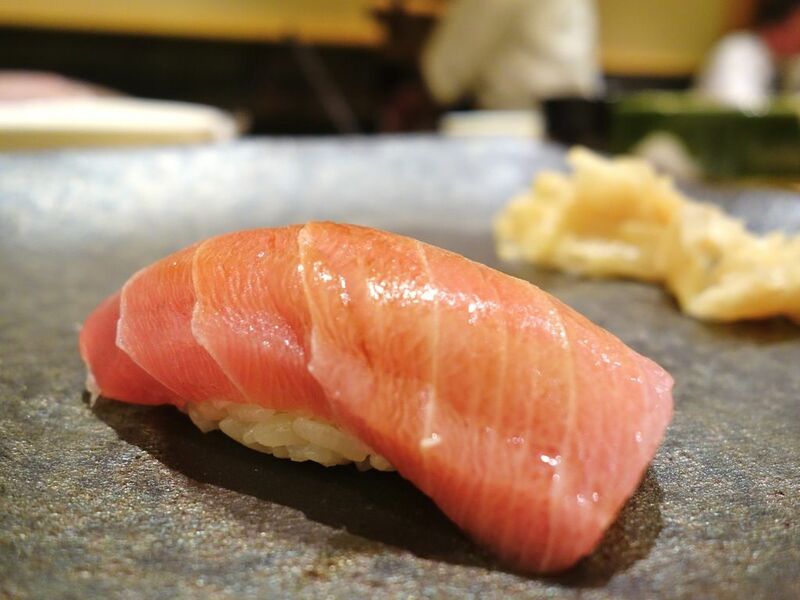 The Otoro, which some people compare to as a piece of lard due to the high amount of fats. 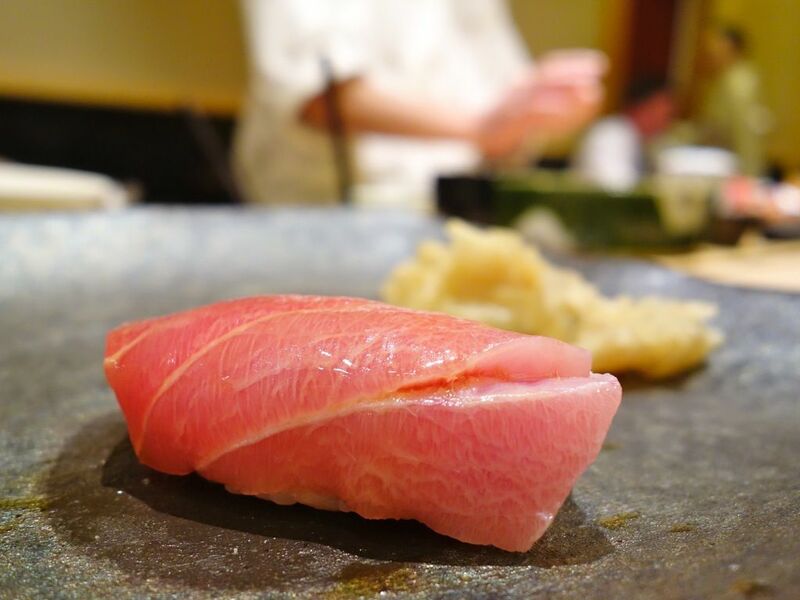 Otoro could have the texture of beef actually but too much fats don't sit that well with me. Thankfully this piece was perfect. 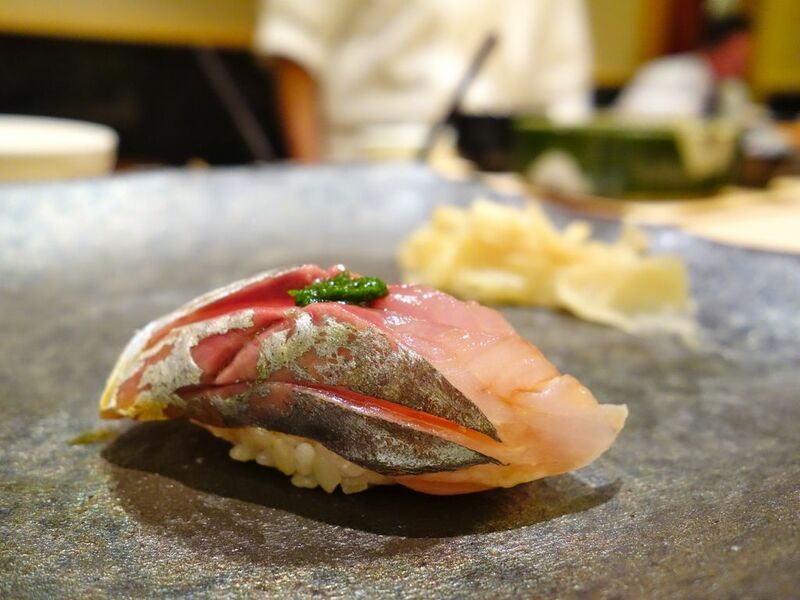 Horse mackerel with shiso leaf and spring onion paste. This is my favorite version yet as it was very refreshing and took away any fishy taste. I'm not a fan of the regular tuna actually but this piece was marinated and aged for 13 days to make it more tender. More wasabi was added to this to counter the fishiness. Murasaki uni! 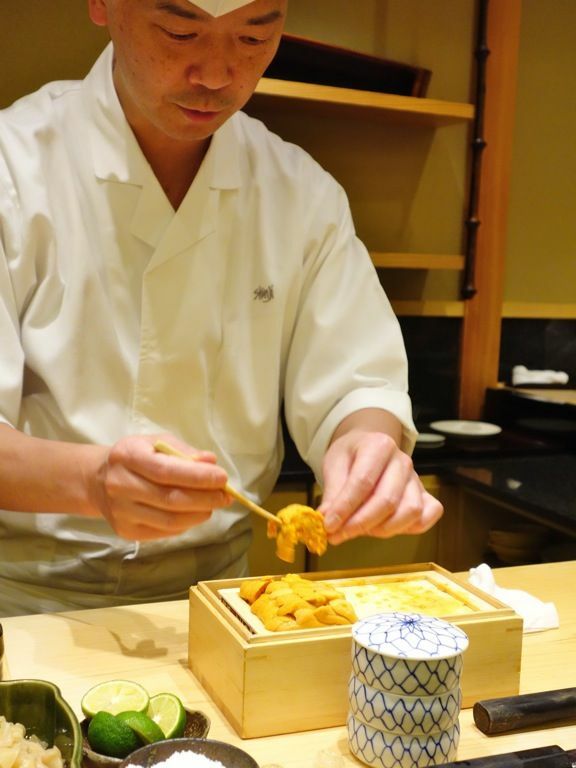 Chef Oshino explained that these are from the short-spined sea urchin from deeper waters. 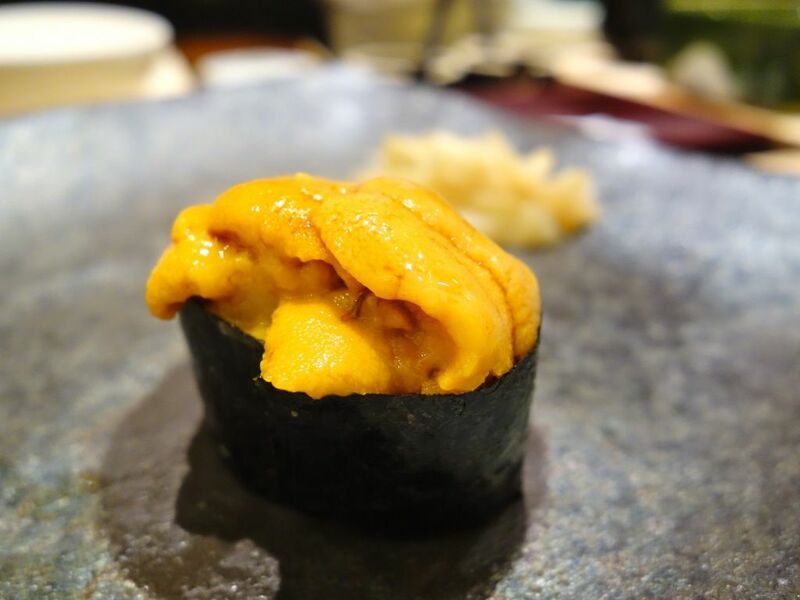 They are of a bright orange color and have a creamier texture as compared to the long-spined Bafun sea urchin which has a coarser texture and stronger flavor. 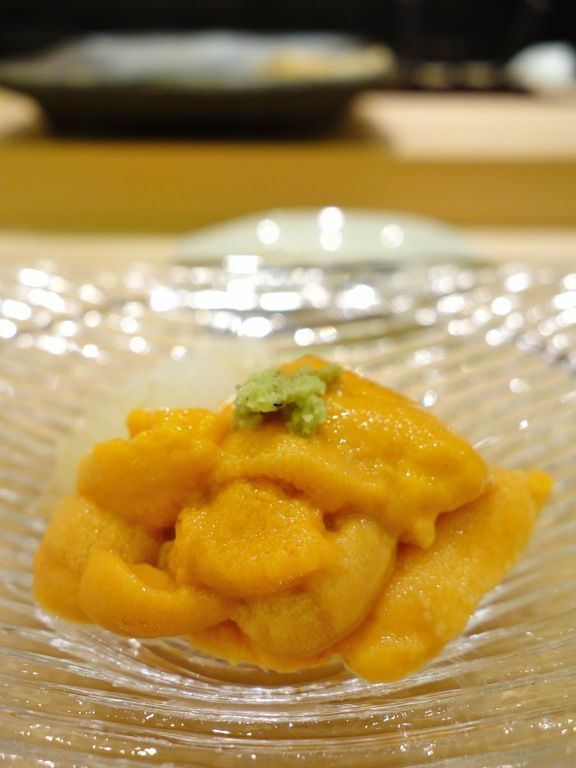 If you're an uni fan, do request for a portion of Chef Oshino's uni rice (about $50/portion). 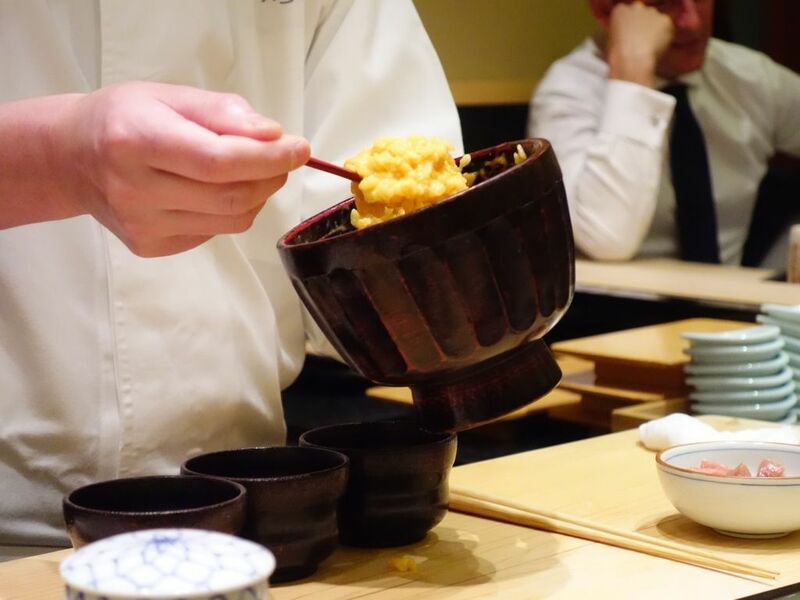 A copious amount of murasaki uni was mixed with the warm sushi rice. Possibly the best uni 'risotto' ever. It comes topped with salmon roe and maguro as well. 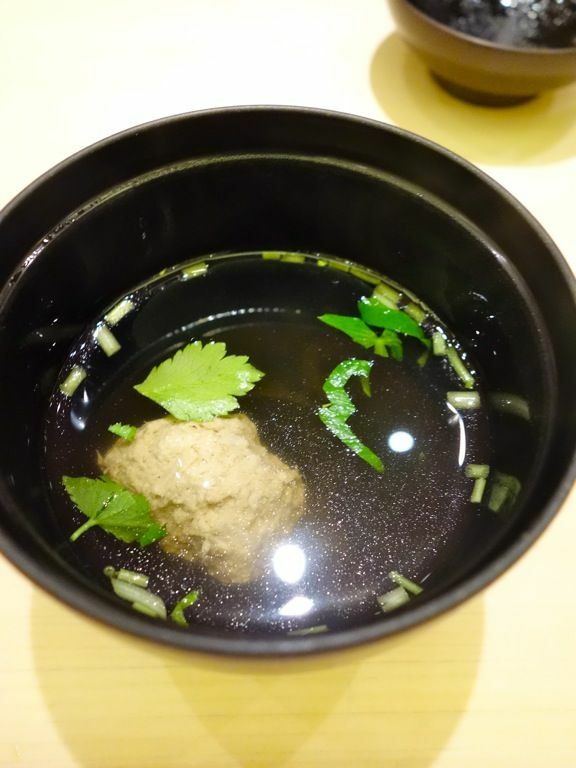 A meatball soup in the middle of the sushi course. Grilled tiger prawn next. Sweet and succulent meat. My prawn was halved for me because I've a small mouth. Hee. 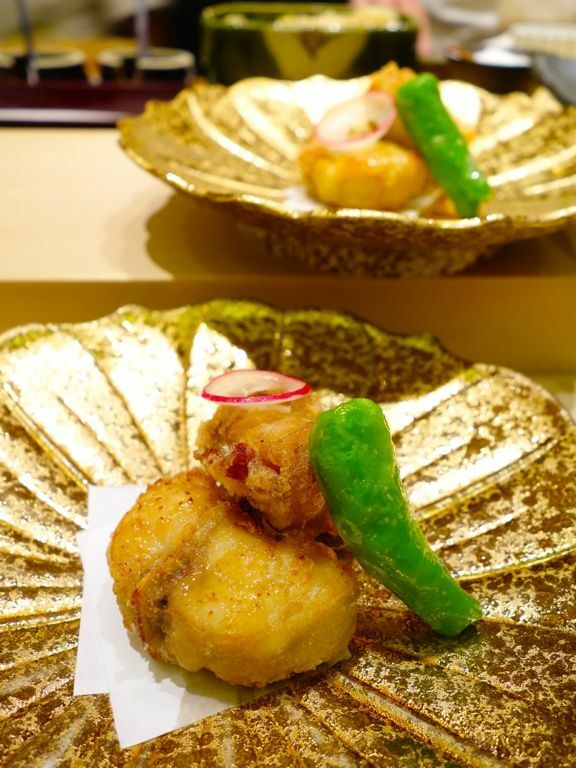 Our fluffy anago was topped with a sprinkle of Yuzu and a light touch of sweet sauce. 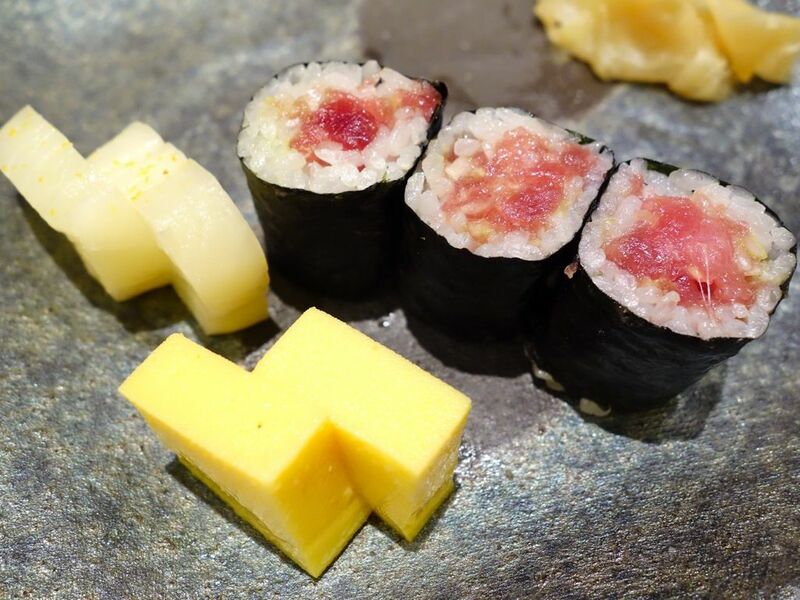 Rounded up the sushi course with a negitoro maki made using Chutoro. Negi (spring onion) is good for masking the fishy maguro or the less fresh meats so it seemed like a waste of the Chutoro, not that I didn't appreciate the better cut. The Tamago (egg custard) was like a panna cotta curd and was sweet as well. 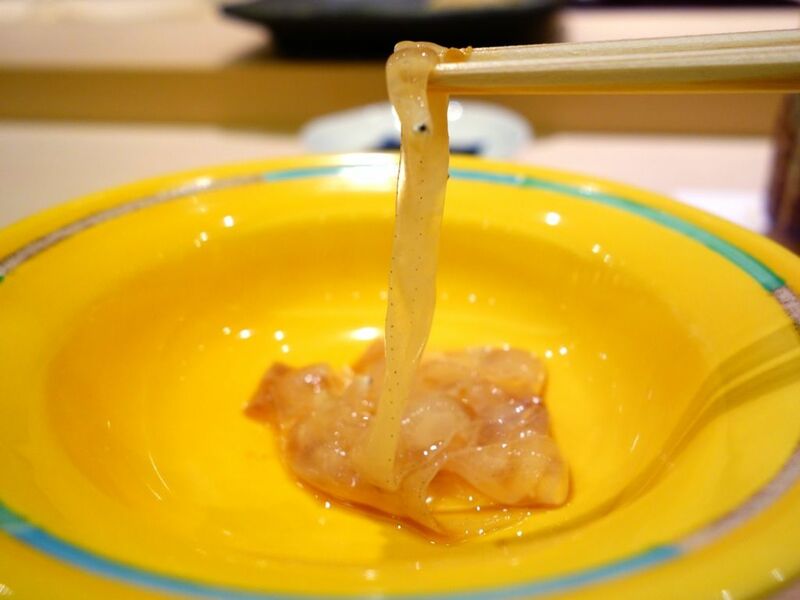 I prefer the savory ones made with dashi though. 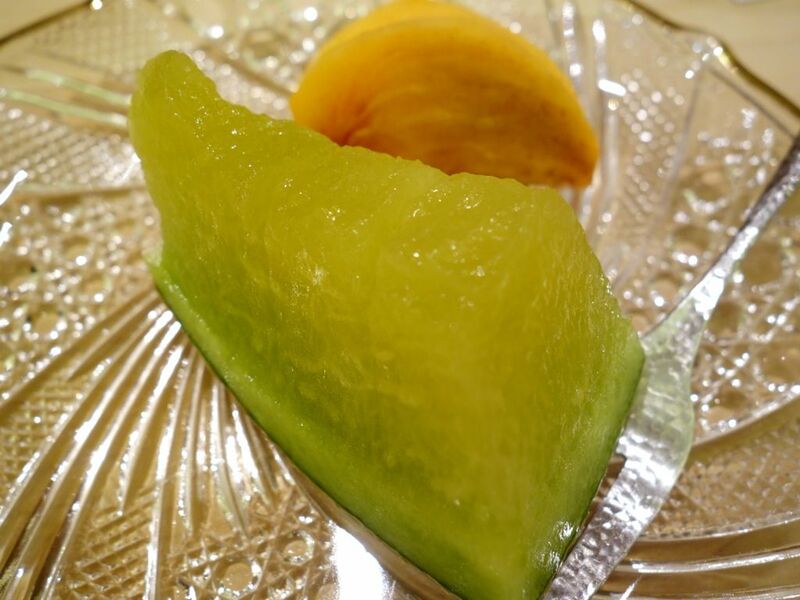 Our meal concluded with fresh sweets, a slice of crunchy persimon and melon from Kyushu. They were just the way I remember them to be. Love. 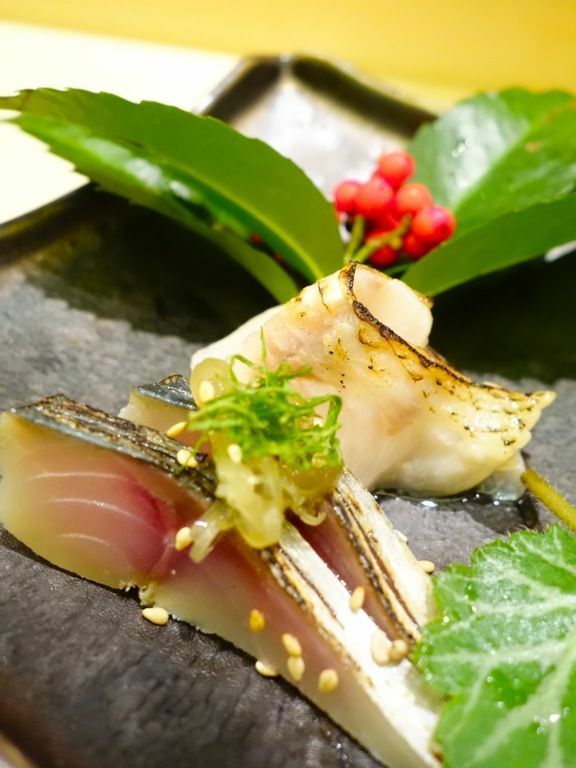 You can be sure of a great meal at Shinji by Kanesaka. 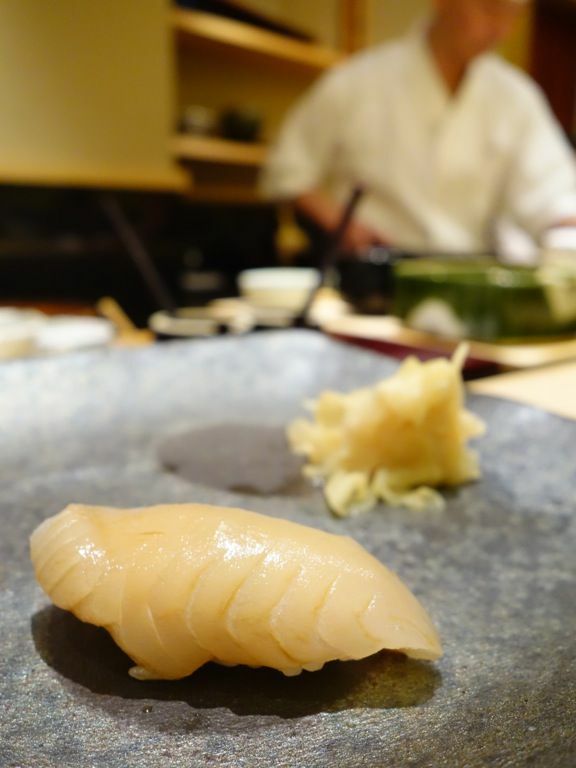 Chef Oshino's 一期一会 (one chance in a lifetime) philosophy ensures that every encounter is cherished and valued. Well, it could also be literally interpreted as "a meeting a week", which IMO is a great interpretation as well. See you soon Chef Oshino.